The shoes, newspapers or other items that hoarders collect can eventually take over their homes. Some people have even been crushed to death when towering piles of their collectibles have fallen on them. Believe it or not, the tendencies that lead to such situations may have evolutionary roots. We are hunter-gatherers, after all, and gathering gone awry is precisely what hoarding is all about. It shows up in the animal world: while there are many examples of animals whose gathering is functional and adaptive—squirrels burying nuts for the winter, for instance—irrational gathering goes on, too. Cats of the short-legged Munchkin breed, for example, collect jewelry and small shiny objects and do little with their stashes. And certain mice compulsively bury marbles. In our work on Doberman pinschers, my colleagues and I have begun to uncover clues to the mechanisms behind hoarding in animals. The results may help researchers understand hoarding in humans. In one revealing study, we focused on a bizarre behavior called flank sucking. An affected Doberman will put its open mouth on its flank, clamp down softly and, adopting a dreamy look, begin sucking. 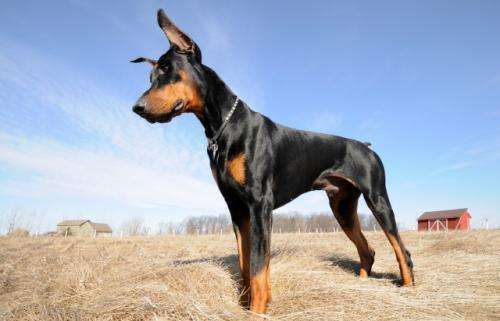 After questioning almost a hundred owners of flank-sucking Dobermans and an equal number of Doberman owners whose dogs do not engage in the behavior, we found that flank suckers also have a strong penchant for gathering, mouthing and ingesting non-food substances. Granted, many dogs do such things, but these Dobermans do them persistently and compulsively, in much the way that humans suffering from obsessive-compulsive disorder might repeatedly wash their hands. They fetishize a wide variety of materials, including fabrics (blankets, socks, toy stuffing, sneakers and crate pads), organic matter (dirt, leaves, branches and twigs), paper products (sheets of paper, paper towels, cardboard, dryer sheets, cotton-tipped swabs and cigarette butts), plastic and vinyl (toys, jump drives, cell phones, pagers, pens, electric toothbrushes, shavers, eyeglasses and remote controls) and metal (nuts, bolts and keys). Some dogs simply lick the objects or carry them around, often bringing them to a particular location. Doberman owners call this behavior "shopping." One video that went viral shows a Doberman that appears to have developed an interesting version of this shopping habit. The dog would arrange three Beanie Babies of the same type, face up, in a triangular pattern. Then it would arrange other toys—always the same type—in a straight line. One day this dog, an aloof rescue animal, finally allowed its owner to give it a big hug. The next day, Beanie Baby bears were arranged in a triangular pattern as usual, but in pairs: one of each pair face up, the other face down, with its arm across its companion, in what looked like a hug. It was as if the dog were trying to communicate. MRI brain scans of Dobermans conducted at McLean Hospital, in Belmont, Mass., under the direction of Marc Kaufman, head of translational imaging there, were revealing. They showed that in dogs prone to shopping and flank sucking, the gray matter in certain brain regions governing emotional, cognitive and sensory and motor functions was significantly less dense. We have also perceived significant differences in a region connecting the two sides of the brain. As it happens, similar anomalies are found in people with obsessive-compulsive disorder, particularly those who engage in hoarding. This leads us to think that Dobermans make a good model of OCD in general and hoarding in particular. After much searching, we have found the flank-sucking/shopping gene, neurocadherin, on canine chromosome seven. This gene sheds light on the biological pathways that may be involved in compulsive collecting. That, in turn, could help scientists develop new treatments for both dogs and humans. The bottom line is that in dogs and other gatherer species, including humans, disordered gathering behaviors derive from normal hard-wired behaviors—behaviors that, in the past, were necessary for survival. Such maladaptive patterns never emerge in wild animals that use their natural programming to sustain themselves. But put a susceptible animal or human in the pressure cooker of modern life—that is, add anxiety and thwarted biological objectives—and out pops a compulsion. For both us and our pets, behaviors that once staved off death now do nothing more than bring short-lived relief from stress. They've become a driving force to spin our biological wheels. If we did not live in the concrete jungle of modern life, we might never have developed our compulsions in the first place.